a business’ resource consumption: goods and services, financial instruments, energy, etc. the businesses industry position: growth, financial, environmental, and location risk, etc. select information on over 30 million companies within the U.S accessed either remotely or housed within our client’s own database systems. Our seasoned staff brings hands-on experience from the energy, telecommunications, financial, and information-based consulting industries for our clients. Oxxford's staff is comprised of industry experienced marketers, data analysts, Ph.D.-level statisticians, mathematicians and computer science professionals. Our core information database competencies are enhanced by our ability to combine a variety of non-linear analytical techniques - this enables our clients to draw meaningful conclusions from a virtually unlimited array of disparate data elements while Oxxford's staff explains every detail of the database process. Oxxford UCIS then provides the information to our clients for use “in-house” by their own experienced marketing, business, or operations staff or through Oxxford-developed web-based or desktop applications. Client’s consumer/residential or commercial customer file is appended with an array, of their choice, of enhanced locational and demographic variables for internal analysis, segmentation, cross selling, strategic planning, and a host of other internally developed applications. Files are encrypted and delivered via secure FTP, DVD or encoded email(s) or other client approved methods. 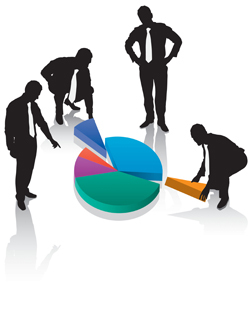 Custom programs or models can be developed with the client to assure the best use of the data in hand. Data mining tips and consultation is always encouraged and welcomed by Oxxford's staff. Web-based access for internal customer analyses or the creation of prospect databases is available through Oxxford’s myriad custom data and analytic platforms.